Need for Speed: Porsche Unleashed (also known as Need for Speed: Porsche 2000 in Europe, and Need for Speed: Porsche in Germany and Latin America) is a racing computer and video game, developed by Electronic Arts Canada and published by Electronic Arts, and is a part of the Need for Speed (NFS) series. 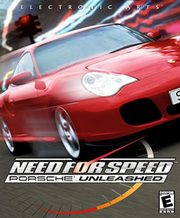 Unlike other NFS titles, Porsche Unleashed centers around racing Porsche sports cars, with models ranging from 1950 to 2000. The game is noted for its extensive information regarding Porsche and its cars. The premise of Porsche Unleashed remains largely the same: Driving and racing sports cars. However, the game only offers Porsches as racing vehicles. The cars handled more realistically than in any other Need For Speed game, and there is an in-depth catalogue of different Porsche parts that span throughout the years. Although the game inherited police chases from Hot Pursuit and High Stakes, the feature is relatively minor and is only seen in the Factory Driver mode (see Modes). In terms of game construction, Porsche Unleashed is most often hailed as NFS's best collaborated effort to bring forth one singular car brand and amplify and deepen the depth of knowledge both on history and motor functions. It features historical videos and many pictures of old photos of Porsche vehicles. The Evolution concept was a hit for many people, creating many new Porsche fans due to the game's high level of academia and depth of Porsche cars. The Factory Driver was also a different kind of unlocking, except to do with performing and excelling in certain slaloms, speed races, deliveries, etc. Many of the missions were considered to be really difficult; anyone who manages to finish Factory Driver can be called a great "computer" driver. Factory Driver - The player has to test Porsches with various stunts and move on with his career. Evolution - Unlocks cars (by purchasing them) in chronological order from 1950 to 2000, advancing through time by completing races and circuits. The range of cars featured in Porsche Unleashed consists solely of a majority of Porsches produced between 1950 and 2000, and are all divided into eras (Classic, Golden, and Modern), which are in turn divided into class ranging from 3 (lowest) to 1 (highest), with the additional Race class. Porsche Unleashed begins by offering a scattered selection of a few models across all eras, and requires that the player play both the Evolution mode and Factory Driver mode in order to gain access to cars. Purchased cars from Evolution mode would be listed in the main menu's inventory, while cars from Factory Driver (which are simply standard Porsches from different eras with custom paintwork) are awarded to the player when a particular challenge is completed successfully. Two or more body variants are offered for the many in the 356 and 911 series, ranging from coupés to cabriolets and targa top versions; aside the cosmetic differences, the body styles affect the handling of the car, due to their different degrees of rigidity. The game also goes includes internally different variants, such as four-wheel drive versions (known as the Carrera 4 series) for later models, which possess better handling than its rear-wheel drive counterparts. Because of this, the number of cars offered is significantly higher (an estimated total of 86 cars) than the fundamental range of models included in the game, although each car may vary in performance. Porsche Unleashed includes a partial range of Porsche models that have served primarily as racing cars in real life. These models are categorized in their own class (Racing) in their respectable eras, but do not have body or performance variations. Races take place in 14 tracks in various locales in Europe, ranging from farmland, to forests, to urban areas. Point-to-point routes introduced in The Need for Speed return to form a majority of racing tracks in game, although several tracks based in one location are circuits. Many of the tracks also include extensive shortcuts, alternative routes and open paths. All tracks can be raced in any of the four combinations of forwards/backwards and regular/mirrored; this is only configurable in Quick Race mode. Alps: Located in highlands that stretches across snow-capped terrain and falling snow. Autobahn: A highway system as it rains. Auvergne: Located along old ruins and a walled medieval city. Corsica: A sunny seaside network of roads that runs along cliffs and canyons. Côte d'Azur: Located along the cliffside coast of France facing the Mediterranean Sea, passing through a fishing village. Monte Carlo: A network of roads within the sideside city, with some of them forming part of Circuit de Monaco. There are 5 combinations of Monte Carlo tracks featured in Porsche Unleashed, sharing parts of the same road layout and each numbering between 1 to 5. Normandie: A rural area passing vast farmland, small farming communities and canyons. Pyrénées: A rural area passing vineyards, a château and mountainous cliffs. Schwarzwald: A trail through forests and logging establishments. Zone Industrielle: A run down industrial park and harbor. An additional online-only conversion of Porsche Unleashed, dubbed Need for Speed: Top Speed, was released in response to both the release of MacGillivray Freeman's 2002 IMAX film, Top Speed, and the Porsche Cayenne. The game features three existing tracks from Porsche Unleashed (which names have been changed to refer to locations in Canada, as the sponsorship of Travel Alberta (Canada) concluded), and three Porsche vehicles: the 911 (996) Turbo, the 959 and the Cayenne Turbo. Access to Need for Speed: Top Speed was bundled alongside the Windows version of Need for Speed: Hot Pursuit 2.